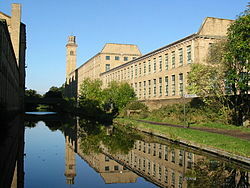 We’re looking forwards to cooking up another tasty Hog at Saltaire near Shipley in Bradford soon. The free range pig has been hand selected from the farm and will provide succulent and tasty local meat for the Hog Roast. Saltaire is where we live and are based and provides an interesting and historic place to live, visit or have a tasty hog roast catering event from The Hog Roasting Company. The old village centre is largely based around a big old mill which is steeped in history and has been converted into quality art, book, home and antique shops along with a restaurant, plus a mountain bike shop too. 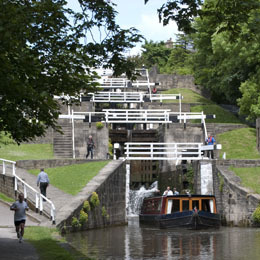 The Leeds Liverpool canal runs through Saltaire and Shipley where along it’s paths we have also had the pleasure of providing lots of Hog Roast Hire from Leeds, Kirkstall, Rodley, Apperley Bridge, Shipley, Saltaire, Bingley and Bingley 5 rise locks, Keighley, Skipton, Silsden, Gargrave and beyond into the Yorkshire Dales which is a popular & successful area for us. This entry was posted in Hog Roast and tagged Hog Roast, Hog Roast Hire, hog roasts, Kirkstall, Leeds, Saltaire, shipley, skipton, Yorkshire, Yorkshire Dales by Gareth. Bookmark the permalink.